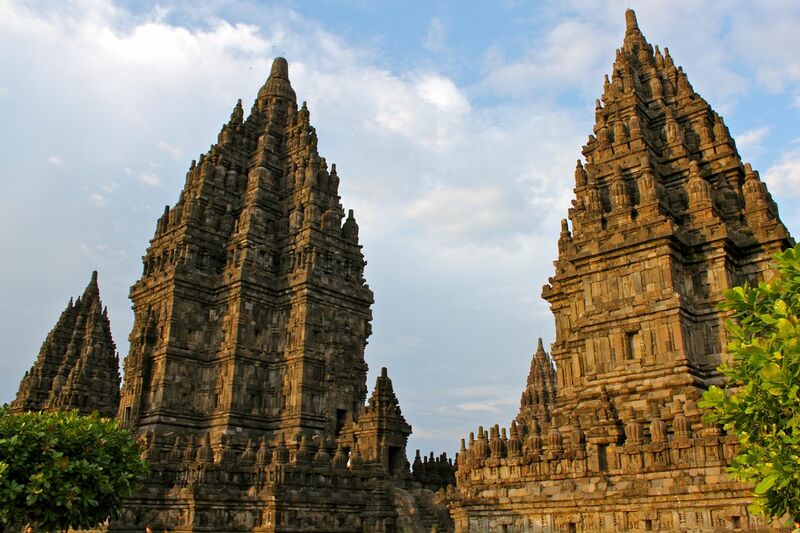 Borobudur and Prambanan temples in Central Java sit less than 26 miles apart. Built during the same century, one is Buddhist and the other Hindu. These two temples offer a powerful example of the confluence of religious cultures in Indonesia (slideshow below). The exact history of the temples is unknown, in part because some debate remains about the political history of the time. The debate rests on whether two rival dynasties existed at the time, in which case the two temples may represent a competition. But the most common explanation we have found is that the region peacefully accepted the two religions at the same time, and that the two temples were visited by many of the same people, including key rulers. Borobudur was built between the late 800s and early 900s. It is a detailed tribute to Buddha’s life and the ways of Buddhism. Religious pilgrims would pace through the temple’s concentric walkways, meditating on the stories depicted in more than 1,100 detailed stone carvings. Each series of carved panels on each of the four levels of the temple depicts important Buddhist lessons. Prambanan is known to have been built very shortly after Borobudur by a ruler who favored Hinduism. The style is not unlike that of Borobudur, with stone carvings depicting Hindu tales. Originally, 240 small temples comprised the site; earthquakes and volcanic eruptions felled most of them over the years. The seven largest temples can be seen today thanks to reconstruction. At the time of our visits to each temple, we saw literally hundreds of Indonesian tourists. Families, tour groups and friends all wandered the temples with the respect one would expect at any historical site. Islam is the dominant faith in Indonesia. Estimates vary, but Islam represents about 75% to 85% of the population; Christianity, Hinduism and Buddhism follow in that order. We saw many Muslim families at both sites (easily identified by women wearing the hijab, the Islamic head covering). Amazingly, Indonesians seem to accept all of these religions as part of their shared culture.